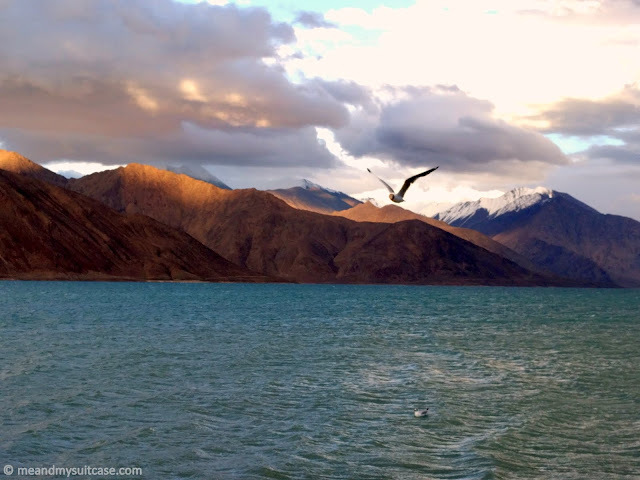 Ask any true traveler and Ladakh will be on the top of their list. The breathtaking landscape, cold breeze, unadulterated blue sky, whitewashed stupas, colorful fluttering prayer flags, picturesque gompas (Tibetan monasteries), the humming sound of praying wheels & bells, rustic mountains, green patches in between, beautiful lakes, snow capped peaks, cold desert and warmth of Ladakhis in this land of two seasons, cold and extreme cold; Ladakh is full of contrasts. It is nestled between the Great Himalayas and the Karakoram mountain ranges (does these words ring a bell? School days? Geography?). I had been planning to go and experience this untouched, undisputed beautiful destination with my buddies since I graduated but guess the time was never right, until I visited it last month with 23 beautiful strangers. Strangers or friends, alone or as a couple; one should visit Ladakh at least once in their lifetime. Here are a few reasons which will sure sweep your feet off! 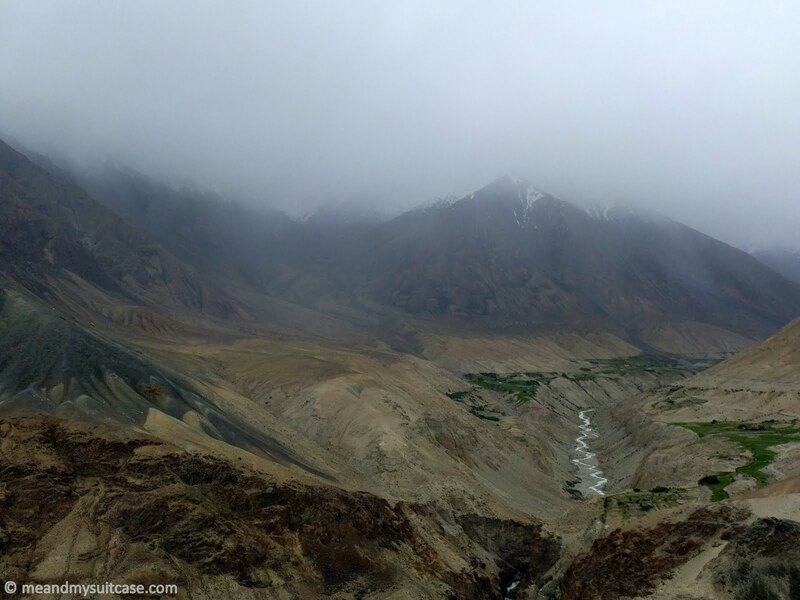 You enter Ladakh and miss out on the warmth of Ladakhis? That never happens. 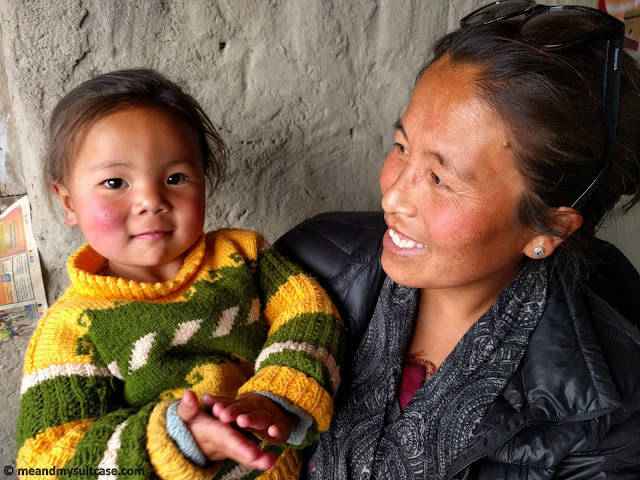 Despite the harsh climate and the disconnect from rest of the world, no special privileges or amenities, they are full of life, joy and only smile. During my trip I never saw a single local with frown. A small conversation with them or even a simple Jullay (Hello in Ladakhi) will fill your heart with love. Kids are real fun. My luck that I got to capture a lot of smiles in my camera and which is one of the best takeaways from the trip. As we entered Ladakh, we were welcomed by a 40 km long stretch between Sarchu and Leh which is a wonder in itself. The stunning natural rock and sand formation is picture-perfect and a delight to all roadies. Mountains on both sides look as if they are never going to end, like an alluring illusion, the Moore Plains. Later we were surprised by the colorful rock formation near Upshi where the gushing river ran parallel to the road. The barren, harsh brown mountains between Leh and North Pullu with minute green patches in between and snow capped peaks in the background somewhere far away was mesmerizing. 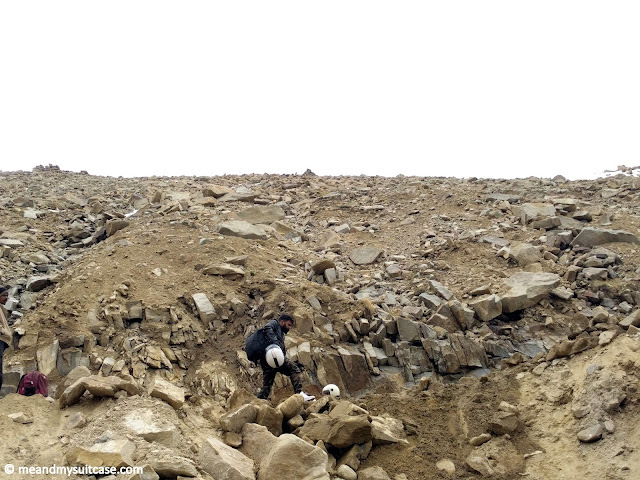 Khardungla did offer snowy lands and mountains where we could have a snow fight while on the way to Nubra we witnessed dramatic whirlpool of sand. Nubra was full of sand but grey, the only cold desert in India. This definitely gonna give you goose bumps. Like landscape, roads gonna take you by surprise as well. 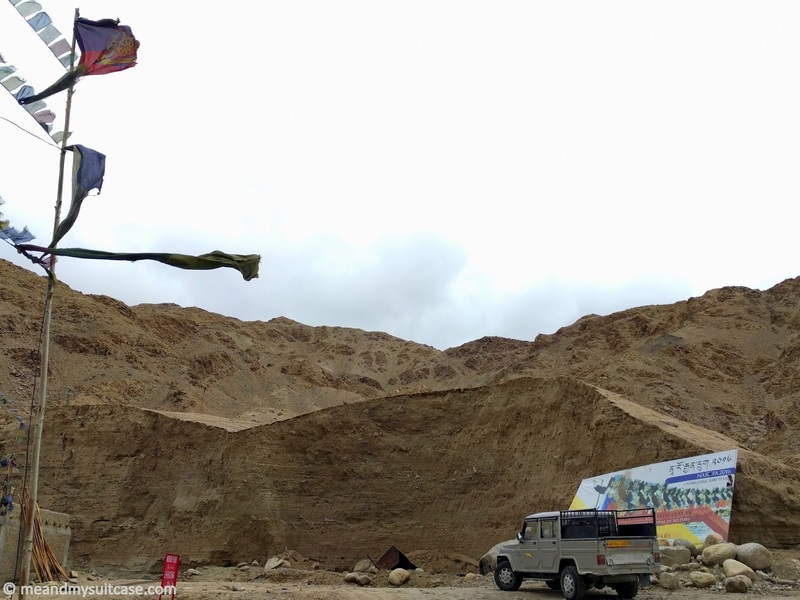 To drive in Ladakh is not for the faint-heart. The road conditions and the fuel stations on the way shall be bookmarked in your itinerary. It is basically the snow which makes the drive tough and at some places the rough terrain which when you drive upon creates a beautiful aura because of the dust. The curves are remarkable. The roads here are maintained by BRO (Border Road Organization), must say, a job well done. You will also be delighted by the witty signs on the way. The BRO projects are also divided so is the essence of those signboards. Manali to Sarchu is being handled by "Deepak", Sarchu to Leh by "Himank" while Leh to Kargil by "Vijayk". The first two are witty while the latter a bit based on emotions but "Himank" is the wittiest. 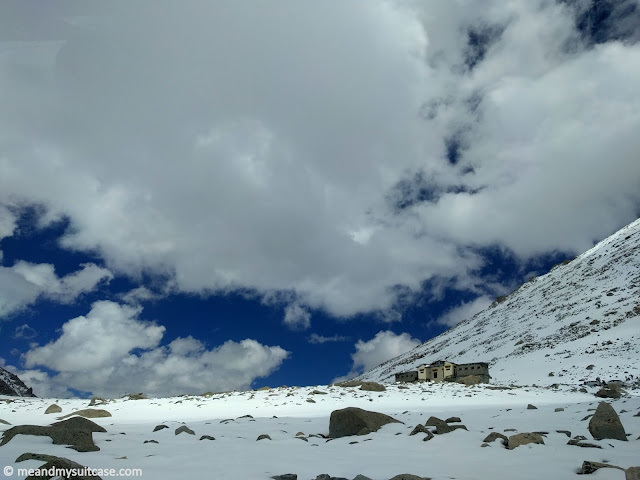 I got a chance to cover the top three highest motorable passes (passes or La) in the world in one go. On our way to Leh from Jispa, we crossed the second highest motorable pass in the world, TanglanLa, but that was not the only highlight of the day, what made this visit memorable was the snow fall, my first ever snow fall experience. It was the moment of euphoria which got stamped on my heart forever. Second cross was through the highest motorable pass in the world, KhardungLa, where we were stuck for 10 hours (story on it in later post) while returning from Nubra to Leh and third we crossed the third highest motorable pass in the world, ChangLa on our way from Pangong to Leh. Don't forget to get your pictures clicked and eat at those places. 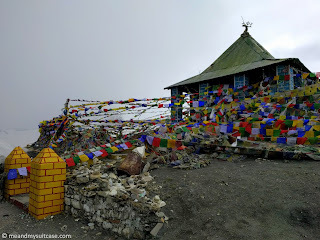 KhardungLa boasts to house the highest cafe in the world "Rinchen" whereas ChangLa has the highest restaurant. All three passes have temples with the same names as well. 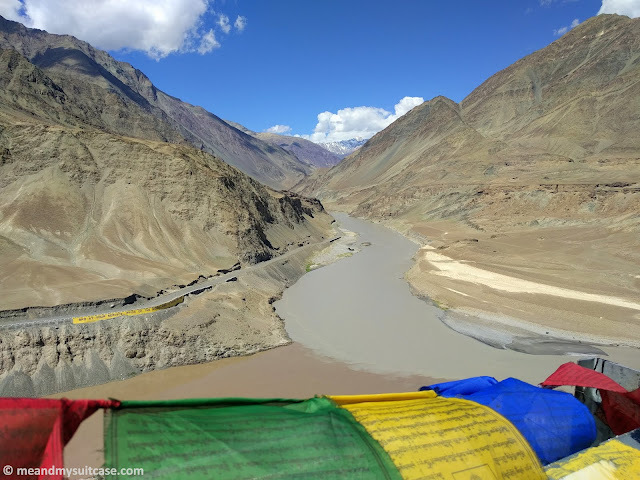 Ladakh is not only the land of high passes but some mystic, supernatural lakes (lakes or Tso) as well and to name a few, they are, Pangong Tso, Tso Moriri, Tso Kar, Yarab Tso. On our trip we visited only Pangong Tso (high grassland lake) which is an endorheic lake. Its beauty runs in 134 km from India to Tibet with around 40% being in India. It is like in the middle of no where, surrounded by barren mountains. The lake changes colour with the change in sun's position and clouds & mountains did have a magical effect as well. In the evening we witnessed the lake in its true blue form while grey in the morning just before sunrise. It was hauntingly beautiful. It is said that when the sky is clear, one can witness the lake in colour orange during sunrise. Ladakh is full of stupas. They are white in color and symbolize peace. One can't miss the prayer flags found strung along mountain ridges, bridges, temples / stupas, etc. They are considered the symbol of peace, compassion, strength & wisdom and are always hung high so that they always flutter in wind and the prayers blows from these flags all around. There are also many famous monasteries, we visited Hemis, wherein we witnessed monks preparing for the Hemis Festival. We also went to Maitreya, a 32 m high statue near Dusket Monastery which is looking down the Shyok River towards Pakistan and is considered as future Buddha. 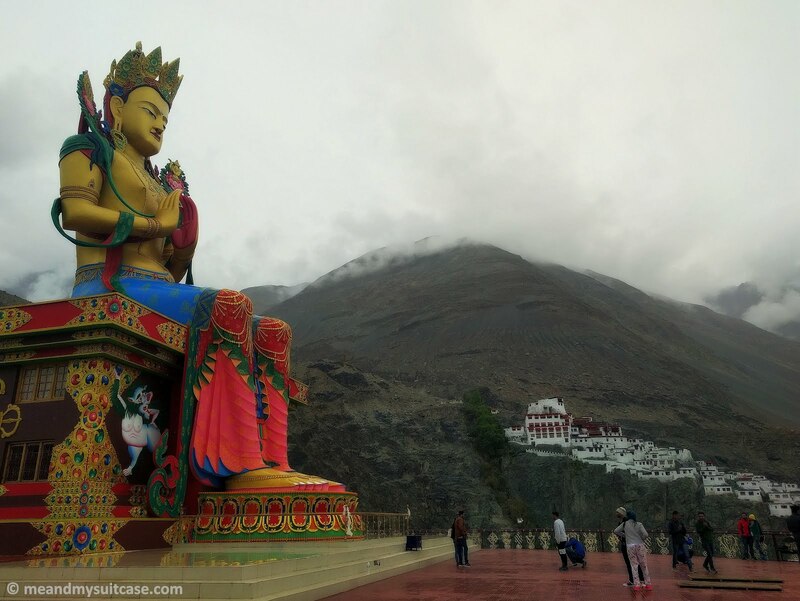 Shanti stupa on the hill of Chanspa in Leh which we visited on a very fine morning is a milestone and is famous more for the panoramic view it has to offer. Patthar Sahib Gurudwara which is being maintained by BRO has a story behind its construction which will amaze you. I can still hear the humming sound of the prayer wheels (in quiet) which shall always be rung in clockwise direction. Stop your vehicle but don't get down and you will be driven up without any push, pull or efforts by engine. The highly debatable place and researches are still on. Some say it's mere illusion while the rest are still trying to find a valid answer. I loved how the rivers followed us wherever we went. Mostly running parallel to the roads we were on. 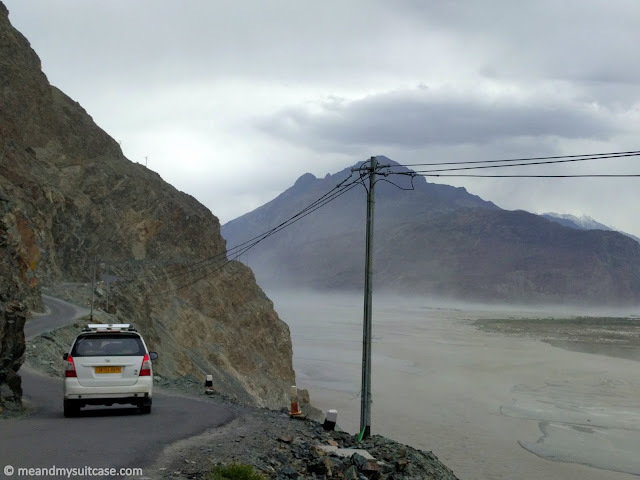 But the climax is the confluence of Indus and Zanskar rivers near Nimmu village which offers a great view. The two rivers can be easily spotted for the stark difference in their colours. Don't forget to stop by and take in the beauty and amazement this another marvel of nature which Ladakh has to offer. This place is also famous for river rafting. 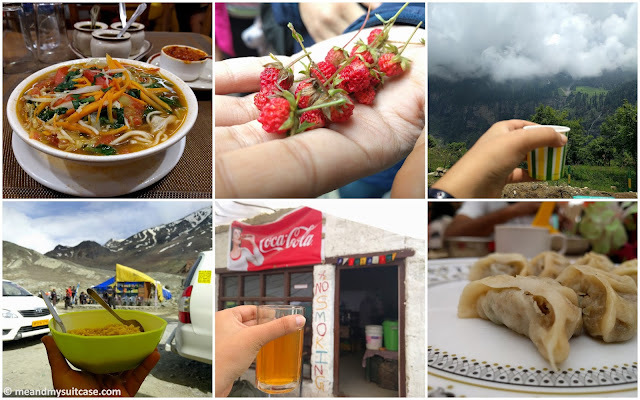 Well, Ladakh is nothing less than a paradise and it has a lot to offer in food. Do try momos, Thukpa (a kind of soup), ginger lemon tea and the list goes on. Local food is lip smacking and I tried these on my epic trip. Getting a signal is difficult, forget internet. I loved the feeling of being away from technology except for using my camera. It was refreshing and I did not feel the need except for the need of talking to parents which was more from their side (my mum should not read this!). Ladakh means disconnecting from the world in true sense and connecting with oneself. 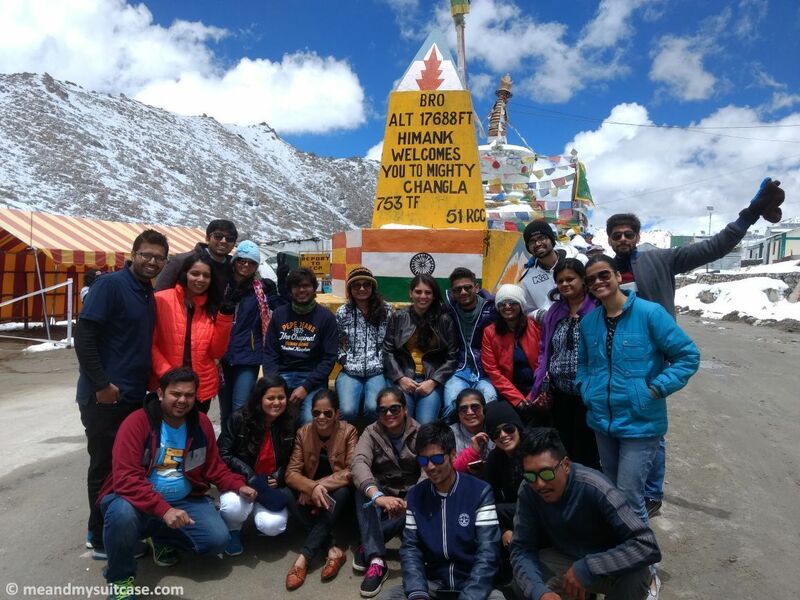 I was stupefied by the greatness of Ladakh in every possible sense, returned very contained with the near "nomadic-like" life and the exhilarating & thrilling experience. I had fulfilled one of my wishes i.e. Road trip to Ladakh which offered me many first of my life from snow fall experience & snow fights to living in camps by one of the most beautiful lakes in the world, the adrenaline rush which i got while snaking through the audacious roads and witnessing the raw beauty wherever I looked. Did I not mention, that you will also be riding on NH 1? 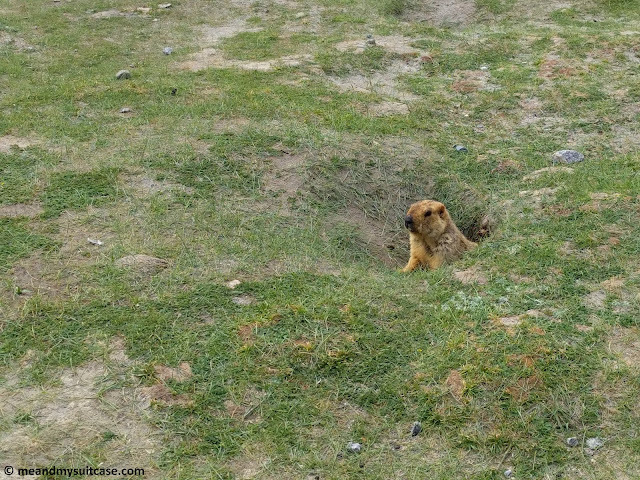 The flora fauna is another big chapter but just to mention, do look out for Marmots (huge sized squirrels) near Pangong. 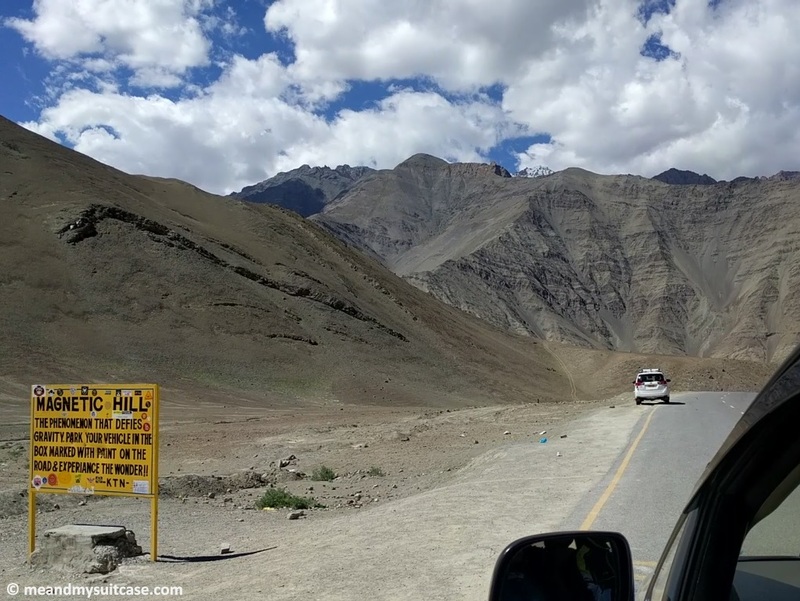 Road trip to Ladakh was dreamy yet real life call, madness yet sanity. Just get acclimatized soon (read here: Altitude Sickness: Tips, Tricks & Hacks) and enjoy it to the fullest. Undoubtedly well written. I could imagine how difficult it is to collate all your thoughts and put them on article without loosing Ladakh's true and magnificent beauty. Enjoyed every bit of this read. Thanks Stuti. Thank you Saumy. Means alot. You should plan and go ASAP ...the beauty is so raw. The scenic beauty of Ladakh is beautifully described. Feel like visiting this marvelous place soon. Thank you. You should go Prescilla. As they say once u been to ladakh , u will definitely go again .. can see ladakh has been imbibed in ur soul..